I'm going to Sequoia National Forest in April. I want to rent a Porsche but my friends tell me to get a Jeep. Will I regret not getting the Porsche?? Has anyone driven around the park before? 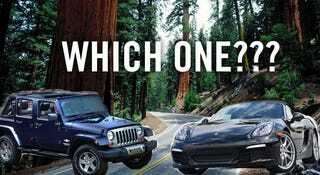 Which is best?? I mean just LOOK at this road!!! !